The Jardim das Perdizes, ìthe most modern neighborhood in Sao Pauloî, is essentially a city within the city of Sao Paulo. Living space is a rare resource in the Sao Paulo metropolitan area, which makes this project very special and rare. The 2.5 million ft2 oasis of open land used to be owned by the Sao Paulo Phone Company. Telefonica, a Spanish telephone company, bought the land from the Sao Paulo Phone Company and used it as a social club for its workers and on some occasions was the home for professional volleyball matches. In 2007, Telefonica decided they had no need to keep this property and placed it for auction. The owner of Tecnisa, a Brazilian general contractor and land developer, was very interested and paid R$100 Million out of his own pockets for the land. Over the course of five years, Tecnisa partnered with GDP, a larger Brazilian construction firm, and the investment bank Banco Votorantim for financial support since Tecnisa did not have the necessary cash flow to finance the project. 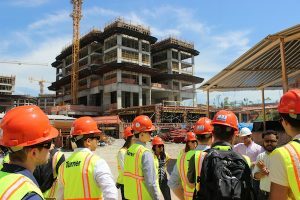 Diego Ungari, field engineer for Tecnisa, hosted the Global Leaders in Construction Management group with a tour of the construction site for the tower that he is responsible for and also demonstrated the immense marketing strategy that is being used to attract clients to purchase the condo units. There are seven different layouts for the units which can range from 1000 ft2, worth R$1 Million, to 2500 ft2, worth R$2.8 Million. There are also pent houses available and they are worth R$5 Million. The success of this project is crucial for the future profitability of Tecnisa since it consumes nearly 80% its resources. This is one of the reasons why some of Tecnisasí directors have already purchased pent houses. Also, Tecnisa has dedicated over R$250 Million in marketing efforts to ensure that all of the condos are sold. 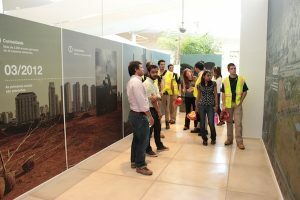 R$10 Million were invested in the construction of a model building to invite potential clients to get the experience of what it will feel like to live in this neighborhood. This building contains a small museum where clients can walk through a maze-like gallery of different images of the project, models of what the neighborhood, and even the sounds that will be heard when they live in this space once it is completed. At the end of the maze there is a theater where every client can watch a short advertisement promoting the neighborhood. Clients can also walk through actual replicas of fully furnished, climate controlled units to enhance the simulation of their living space. So far 80% of the condos have been sold and it is expected that there will be 5000 residents once all of the units are sold. Every three towers have dedicated outdoor/indoor pools, game rooms, party rooms, day care, and fitness centers. At the center of the space is the central park which is open to the public as well. There will be over 2000 trees, a track, a bike path, as well as childrenís and fitness playgrounds. This project is very risky in the sense that a lot of money is being allocated towards financing the cost of large amounts of equipments and staff. At its peak, Tecnisa is planning to have 3000 people on site. 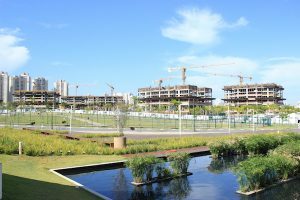 Overall Jardim das Perdizes is expected to be completed in later this year.